Short-term movements in price suggest gold is a risk-off asset. The gold correlation with risk-on assets like oil and equities should be negative in this scenario. However, the evidence suggests that gold behaves like a commodity in the long-run. 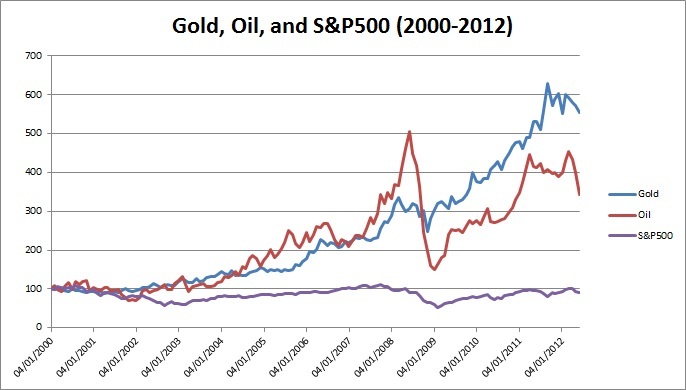 Gold has a positive correlation to oil and a negative correlation to stocks. The magnitude of this pattern increases as the data term length is increased. We often hear the assertion that gold is negatively correlated to stocks, while oil is positively correlated: gold is a safe haven play, while oil is cyclical. This idea seems to be corroborated by day-to-day movements in prices: on days when the stock market is up, the oil price often increases, while the gold price is down. But this commonly held view is not supported by long-term trends in prices. Commodity prices, including gold, tend to go up as a group over prolonged periods of time. Conversely, these decades are often difficult periods for financial assets, like stocks. Take a look at the charts below. The 1970’s was an excellent decade for real assets like gold, oil and most of the other commodities; but a very poor decade for financial assets like stocks. There would seem to be a clear positive relationship here between gold and oil and negative relationship with stocks. Over the next 20 years, we witnessed an inversion of the trend of the 1970’s. Financial assets that were levered to economic growth did well, but real assets like gold and oil did poorly. The last 12 years have seen a return to the conditions of the 1970’s. Commodities appear very much correlated with each other, but have an inverted relationship to equities. 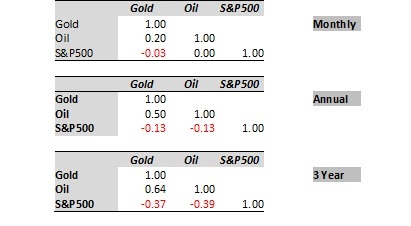 If we examine correlations using monthly data we find that oil and gold correlations are broadly flat with the S&P500, whilst the correlation between gold and oil is slightly positive. However, when we extend the length of the measurement period- such that we are measuring correlations across annual or 3 yearly changes in data- we notice 2 marked patterns. 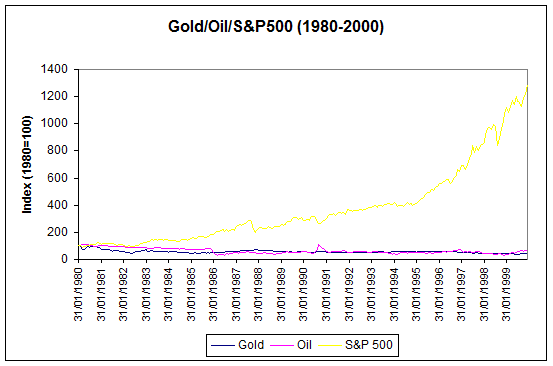 Firstly, the positive correlation between oil and gold increases in size as we lengthen the measurement period. Secondly, the negative correlation between gold and the S&P 500 increases as we increase the measurement period. I suspect this is the cause of the confusion: although on a day-by-day basis, oil exhibits cyclical properties and tends to move in tandem with the equity market; over the long-run, gold & oil are very much part of the same commodity complex and will move in tandem together. 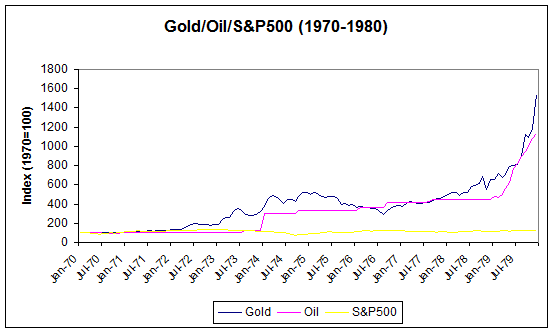 Hence gold and oil are correlated far more in the long-run than over day-to-day movements and negatively correlated to stocks as the charts above suggest. Short-term movements in commodities have masked the longer term trend in prices. We are able to explore the long-run co-movements in prices by summing together monthly data and measuring correlations across the summed data. In the long run, gold correlation data shows gold is very much correlated to the other commodities and will move up and down with them in a broad commodity cycle. Gold, like the other commodities, is inversely correlated with equity markets over the course of a cycle.